Welcome To NaijasilverEntertainment blog: Sponsored: Teacher Volunteers Scheme (TVS) Providing Local Solutions to Global Challenges. 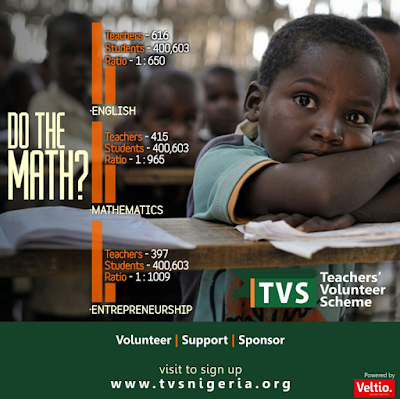 Sponsored: Teacher Volunteers Scheme (TVS) Providing Local Solutions to Global Challenges. In 2014, it was stated by UNESCO that the world needed 4 million more teachers to get every child in a classroom. That’s according to a 2014 report from the United Nations Educational, Scientific and Cultural Organization (UNESCO), which details the acute global teacher shortage currently taking place in 93 countries. If these countries were to achieve universal primary education over the next few years, they would need to hire millions more teachers, UNESCO found. The teacher shortage is most extreme in sub-saharan Africa, where over 70 percent of countries currently need more teachers. As it stands, schools in the region suffer from overcrowding and a severe lack of resources or building maintenance. Here is a statistic from Akwa Ibom.